Many of our readers who have never tried Adipex asked us for more info on Adipex, so here it is. We use Adipex together with a diet plan and exercise to treat obesity in people who have high blood pressure, high cholesterol, or diabetes. Adipex may also be used for purposes. Before taking this medicine consult with Dr. mansfield first. Do not use Adupex if you have taken an MAO inhibitor in thr last 14 days. A dangerous drug interaction could occur. MAO inhibitors include isocarboxazid, linezoid, phenelzine,rasagiline, selegiline, and tranylcypromine. Although it is not known how this medication helps people to lose weight. It works by decreasing your appetite, increasing the amount of energy used by your body, or by affecting certain parts of the brain. This medication is an appetite suppressant and belongs to a class of drugs called sympathomimetic amines. What is the most important information I should know about Adipex-P? 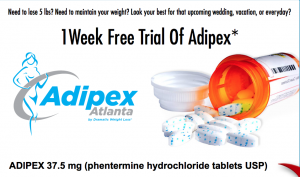 Adipex-P will lose its effect after a few weeks and should be discontinued when this happens. If you try to boost its effectiveness by increasing the dose, you will run the risk of serious side effects and dependence on the drug. This drug may cause primary pulmonary hypertension (PPH), a rare but serious disease of the lungs. Symptoms include difficulty breathing, chest pain, shortness of breath, fainting spells, or swollen ankles. Rarely, Adipex-P may also cause valvular heart disease.